Welcome to the Pinnacle, located at 2507 South Ocean Blvd. North Myrtle Beach S.C. 29582..THE BEST VALUE on the beach according to past guest reviews.We maintain an impeccably clean condo, I demand it! We have never had a unsatisfied customer (read our reviews). We also have available additional items to rent to make your vacation more enjoyable.Were a quiet family beach! Celebrating our 20th year! Thank you for making 2018 our best year ever. New for 2019 New flooring was added to all rooms. We also added a new ceramic tiled walk-in shower in the master bath. We replaced the kitchen and added a 42' flat panel TV in the living room and a 40'' lcd TV" in all the bedrooms. All new Wellborne cabinets and granite countertops with all new stainless steel appliances. Everything you need is there. We have high speed DSL with Wi-Fi. Free Long distance phone calls from condo. In 2011 we remodeled the 2nd bath to include new sheetrock, vanity with granite and new tiled shower. Book now and get the week you want, not what's left! Our condo is Direct Ocean Front.Just open the sliding glass door in the master bedroom or living room and fall asleep to the sounds of the ocean. Enjoy a luxurious family vacation in our 3 bedroom/2 baths 1200 sq/ft condo. We can even supply towels and linens for just $25 a bed if needed. We can also arrange a Jimmy Buffett Margarita machine ($25.00) for the week waiting for your arrival. Don't want to pack corn hole boards? We've got'em for $75.00 a week. That's a deal.We also offer limited covered parking to keep your vehicle out of the hot summer sun. Reserve now and get the week you want, not what's left!! For your convenience, there are (2) elevators that take you quickly to the (5th) floor. All concrete and steel construction for added saftey and beauty with a sprinkler system. Reserve thru us and you won't have to wait to check-in at the real estate office to get your keys, we mail them to you ahead of time, which means more vacation time. Reserve your week now. Just check our calender to see if your week is still left! Our condo offers a breathtaking view of the beach and is wonderfully decorated. We have a large balcony to have coffee in the mornings or relax with a drink at night. Spend leisure-filled days lounging on the beach or playing in the water. 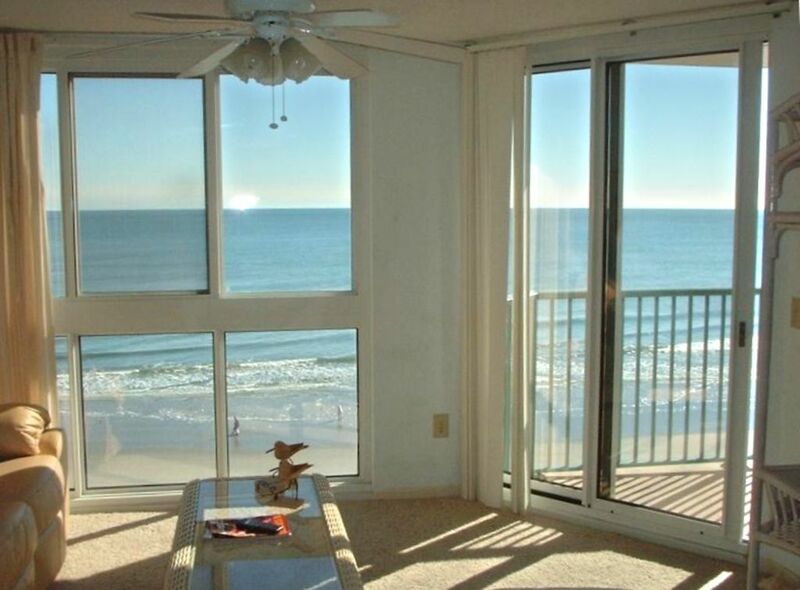 Watch the ocean from your private balcony off the master bedroom, and living room via sliding glass doors. The master suite features a king size bed with KingsDown mattress , a 40'' flat screen LCD TV and DVD. The master bath has a Ceramic tiled walk-in shower with double vanities. The 2nd bedroom has a new Bassett queen size bed with KingsDown mattress, 40'' flat panel lcd TV with a Sony DVD player and a walk-in closet. The 3rd bedroom has Queen Bassett bed also with a 32'' flat panel lcd TV with a Sony DVD player and a walk-in closet. The 2nd bathroom is just in front of the two bedrooms. Mom and dad will love our oceanfront location with Beach lifeguards (in summer) in front of the building,indoor/outdoor pool,covered parking and keyed security doors. The kids just love the sand and waves. Pinnacle has everything you'd expect and more! Close to putt-putt, arcade, shopping, golf and of course restuarants. Call 704-490-8901and make your reservations today! BOOK THE WEEK YOU WANT, NOT WHATS LEFT! NOW AVAILABLE: Linens and bath towels- beds made and towels hung for your arrival. This option available for $25.00 per bed. Jimmy Buffett Margaritaville machine. Make your own fruity drink or smoothie for $25.00 a week. Why waste car space when your corn hole boards are already there. Order these for $75.00 a week. Keeps the young and old happy for hours on the beach. Owned condo since 1999 everyone loves it. NOW AVAILABLE: Linens and bath towels- beds made and towels hung for your arrival. This option available for $25.00 per bed. Jimmy Buffett Margaritaville machine. Make your own fruity drink or smoothie for $50.00 a week. Why waste car space when your corn hole boards are already there. Order these for $75.00 a week. Keeps all ages happy for hours on the beach. Only allowed outside on the balcony. Heated to 80 degrees year round. Spring the sides are removed to reveal a outdoor pool.